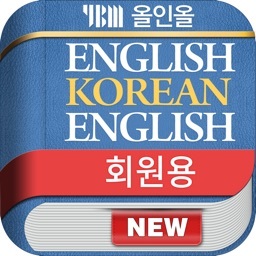 YBM 올인올 영한 사전 - EnKo DIC by DaolSoft, Co., Ltd. The YBM All in All English-Korean for iPhone/iPad/iPod touch contains all headwords from "YBM All in All English-Korean Dictionary" published by YBMsisa.com. 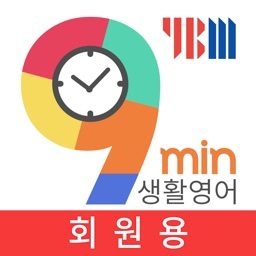 YBM 시사닷컴의 "YBM All in All 영한사전"의 모든 표제어를 모두 탑재하였습니다. 국내 최고의 어학 학습 전문 기관인YBM/Si-sa가 방대한 어휘를 수록하여 새롭게 만든 "YBM All in All 영한사전" 사전입니다. 21만여 개의 표제어, 약 46만 개의 풍부한 어휘를 수록하고 있어, 최대의 표제어, 어휘, 예문 등을 수록하고 있습니다. - 국내 최대의 시사엘리트 영한, 한영 대사전을 바탕으로 집대성한 이번 통합 영어 사전은 풍부한 예문을 통해 일상적인 실용 영어를 학습하는 데 도움이 되도록 하였습니다. - 영어 학습에 직접 이용해 보시기 바랍니다. 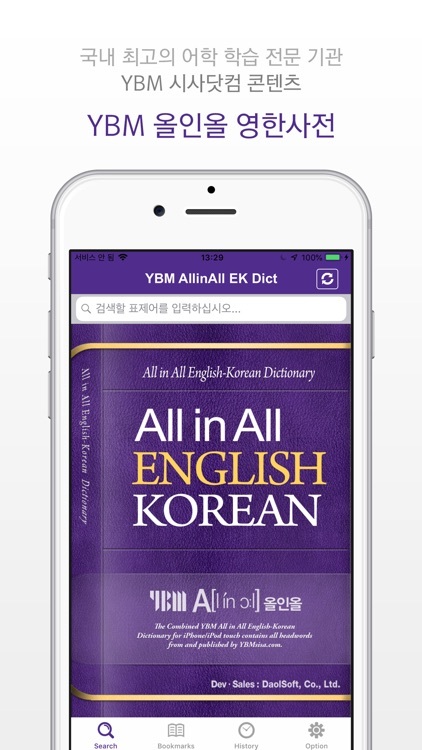 This application is a dictionary of "YBM All in All English-Korean Dictionary" published by YBM / Si-sa, the leading language institution in Korea. It contains enormous number of headwords, words and examples including approximately 200,000 headwords and 460,000 words from the English-Korean Dictionary. 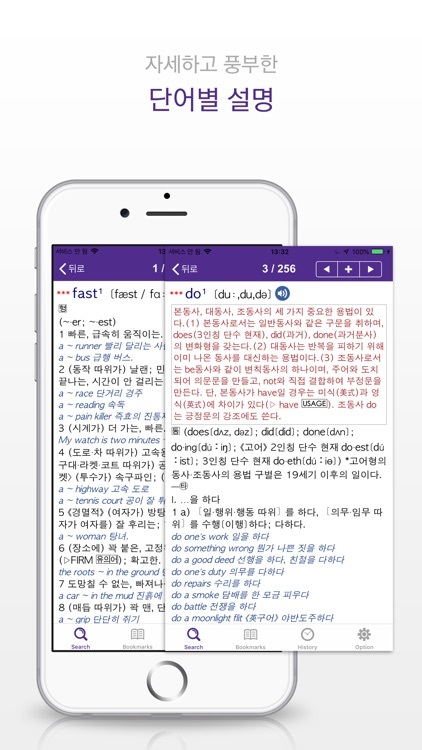 - This is one of the best English dictionaries, with the compilation of all available vocabularies based on Si-sa Elite English-Korean, the largest English dictionaries in Korea. 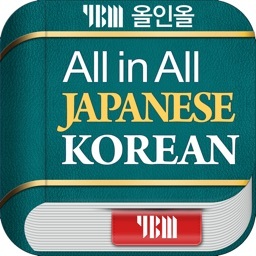 A great deal of examples in the book helps to study everyday practical English. - English-Korean Dictionary contains as many abbreviated words and place names as possible, which are widely used in the world. It also contains a great deal of person names including living celebrities. 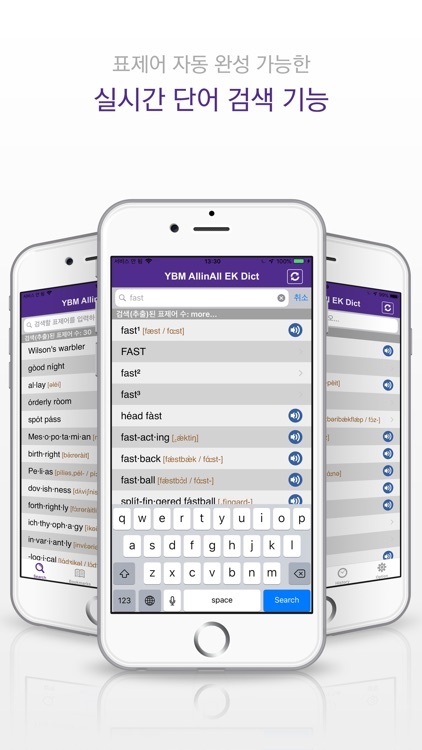 New meanings of words have been added to help study living English, and a lot of examples, word usage, synonyms, antonyms and analogues are contained as well. 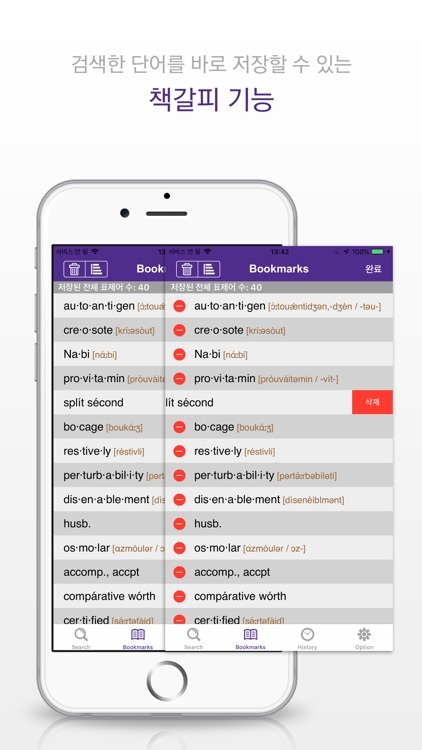 - Make good use of them in your English learning. 1. Hyperlink (quick jump) features. 2. Sweeping action to lookup the previous or next headword. 3. Supports native speakers' pronunciation of headwords. 5. Search by each word of compound headword..
7. Bookmark and history feature. 8. In the Option item of the program, a user can change the font size of the list of extracted headwords and the bookmark list.